Invisalign braces are an invisible and genuinely effective alternative orthodontic straightening method to old-fashioned fixed-metal braces. Made from one millimetre thick clear plastic, Invisalign retainers are almost impossible to see unless you are aware the patient is wearing them. For many patients who have always wanted straight teeth but been too afraid or concerned by the ugly wire and bracket metal braces, Invisalign is the straightening answer they have been searching for. Introduced at the start of the new millennium by Align Technologies, the Invisalign system involves wearing a series of these clear plastic retainers (usually about 20 to 25 in total) for periods of two weeks each. Each retainer has been designed and manufactured using computer-guided technology to make small adjustments in the teeth gradually moving them in to the right position. The obvious advantage of the Invisalign system is the level of discretion provided but also important to remember is that the retainers are completely removable. This means they can be taken out for big social occasions and crucially for eating. This greatly limits the impact of the braces on your lifestyle meaning for the first time there is a brace that fits around you and not the other way round. The cost of Invisalign braces will vary depending on the nature of treatment required but will usually be competitive with most other forms of straightening treatments. This is just another reason why dentists are seeing more and more patients opting for the Invisalign system.Invisalign is a flexible and effective way of straightening teeth. The retainers will have the minimum impact on your life and the maximum impact on your smile. Invisalign braces were not the first clear plastic retainers on the market but they are certainly the first that offer an authentic straightening power. The retainers offer the best of both worlds for patients eager to have the perfect straight toothed smile. If you are considering teeth straightening treatment, speak to your dentist about Invisalign braces. Teeth are essentially indestructible under the correct conditions. However, in the living person, teeth are continuously being assaulted by microbial challenges. Dental caries ranks as one of the most universal burdens of man, but are not life- threatening. Dental caries is widespread in India. Advances in preventive procedures to deal with this disease have significantly reduced the overall caries rate. More than one-third of poor 2 – 9 year old children have untreated decayed primary teeth, and this number varies with age and race/ethnicity.Dental caries is highly prevalent in India, which is influenced by the lack of dental awareness among the public at large. Dental caries is a multi-factorial disease requiring a susceptible host (a tooth), cariogenic microorganisms, and a suitable substrate (e.g., sugar) interacting for a sufficient length of time. Streptococcus mutans is the primary etiologic agent of this disease. Sm is transmissible, and a positive relationship exists between the number of Sm and dental caries. Dental decay did not become an important health problem until sucrose (sugar) became a major component of the human diet. However, good oral hygiene can reduce the chance of caries by reducing the number of cariogenic bacteria and removing the substrate, sugar. Sm is the primary etiological agent of dental caries in man and other animals. Under normal circumstances of health, Sm procduces bacterial acids that cause a continuous minute demineralization of the hard tooth surfaces. In addition, the consumption of acidic foods and drinks, and even toothbrush abrasion can cause enamel demineralization. If this demineralization is limited, the body’s own remineralization capability is able to restore the tooth’s lost minerals by using minerals available in saliva. Dental decay (caries) is the result of irreversible solubilization (demineralization) of tooth mineral by acid, predominantly lactic acid, formed by plaque bacteria that adhere to teeth surfaces, after the consumption of foods that contain fermentable carbohydrates (sugar). Frequent sucrose ingestion increases the lengths of time that sucrose is available for fermentation and acid formation by plaque. Thus, eating frequency, the amount of sugar retained in the mouth (particularly on tooth surfaces), and the length of time that sugar is retained in critical areas, are more important than the total amount of sugars consumed. The chemical conversion of sugar into simpler substances causes a quick decrease in pH (5.0 or <) at the plaque-enamel junction. Frequently consuming sugar or sugar-based foods causes Sm to flourish and become the principal bacterial organism in plaque. A drop of pH to this level puts undue pressure on the buffers in the saliva and lactic acid (the end-product of Sm metabolism) spreads into the outer layer of the tooth (i.e., enamel) causing it to begin breaking down, and to discharge calcium and phosphate ions at areas below the top surface enamel. This low (acid) pH is derived from acid-producing bacterial organisms, and favors demineralization over a period of time, resulting in a cavity. The tooth enamel (which is made up predominantly of hydroxyapatite) is permanently dissolved from these acids, particularly lactic acid. These bacteria begin to adhere more strongly to the tooth surface and form bacterial colonies or communities called “plaque”. Sm and other bacteria, such as lactobacilli, store sugars and continue to secrete acid long after the food has been swallowed. Dental plaque will continue to build up on the tooth surface, unless it is adequately removed. These processes result in dental decay. The quest to control or eradicate dental caries has been on for a long time. Treatment of dental caries involves restorative or pulp therapy which is not only expensive but also painful and demanding for the children. Considering these factors prevention of caries seems to the most acceptable and desirable option.Proper dental care starts with selecting a good tooth brush. Start the process by selecting a soft-bristle brush to remove plaque and food particles. This is very important as this is where the tooth decaying bacteria thrive. There are many varieties of brushes available in the market. Try to replace your brush every two to three months. The tooth paste you use also matters a lot in your dental care. Depending on the condition of your teeth there are many kinds of tooth pastes available in the market. There are tooth paste for cavities, gingivitis, tartar, stained teeth and sensitivity.Proper brushing will cost you only two minutes. Many of us have received amalgam (silver) fillings, but Dr. Goma’s cosmetic dentistry practice has made noticeable metal fillings a thing of the past. Aside from creating a more appealing smile visually, metal-free fillings may also be better for your health. Despite warnings and scientific proof that metal-free fillings are a better choice than metal amalgam fillings, many patients are not well-informed as to the benefits of metal-free fillings and the risks of metal amalgam fillings. Metal free fillings come in two specific options. -Composite Resin dental fillings are made of a plastic dental resin. They are strong, durable, and create a natural looking smile. When this material is used to fill cavities, its color looks like your natural tooth. -Porcelain fillings are also available and have certain advantages. These fillings require less of your natural tooth material to be removed and don’t transfer hot and cold temperatures as much as metal fillings do. Dental bonding is a cosmetic dentistry procedure that involves the application of a durable resin material to the tooth. A dentist will use a special light to harden the resin material, which is similar in color to your teeth, to make it bond to your tooth to improve or restore your smile. • Protection for your tooth’s root or a portion of it which has been opened when your gums recede. Are Dental Implants Expensive ? Deciding whether you can afford the cost of dental implants can be a complicated process. Dental implant prices depend on many factors including your own overall health, the complexity of the problem, whether additional bone grafting may be necessary, and the cost of the materials used. There are different types of dental implants used in dentistry. There’s been great success with “osseointegrated” implants. It’s a system where the bone and implant mesh. A chemical and mechanical bond is formed so the jawbone actually grows into the implants. The most rewarding part of these successful implants in dentistry is that patients are happy with the results for years. Dental implants are used in different ways by dentists. You may require a single implant to bridge a gap, or two implants to support a bridge. Or, if a lower denture needs to be stabilized, two to four implants might be required.Unfortunately, if your jawbone can’t support an implant due to bone loss, tooth implants may not be an option.After consultation we will provide best treatment alternatives for you.However, if you have a sound jawbone, dental implants are the best thing offered in dentistry next to real teeth. In the initial many patients feel that dental implant treatment is expensive compared to other dental procedures. However, Dental Implants represent a more permanent and natural solution than other dentistry treatments, for instance complete Dentures or Partials. Dental Implants are therefore a greater initial investment. Dental Implants should last for years, even a lifetime if they are properly fitted and cared for. For more information on Dental Implants In India call Goma Dental at 177-645-0704. To all my friends, co-horts, colleagues, and partners in geekiness, I’d like to wish you a most blessed of holiday seasons. To those of you who do not celebrate Christmas, I hope your special holiday brings you joy, cheer, and happiness. Having a missing tooth or teeth can be the source of great embarrassment and the root of self-confidence and esteem issues. After all, we all want to have a perfect smile and a missing tooth is a definite barrier to that, but a missing tooth can have other health implications beyond the psychological. If there is a tooth missing in the dental arch it can cause all the other teeth to lean into the space. This can cause alignment problems that can also affect bite, causing irritation and the development of painful jaw conditions called TMJ. It can also be the case that a missing tooth can cause sagging of the facial tissue. Teeth act as rigid supports for the facial muscles and if they are missing the muscles can lapse giving a sunken and unhealthy appearance to the face. Therefore it is important to replace the missing tooth as soon as possible to limit the effects of a missing tooth. Therefore, it is important to replace missing teeth for physical reasons as well as cosmetic. There are several options for patients with missing teeth. A dental bridge or partial denture provide a more flexible and short-term solution to a missing tooth but many patients find these too flimsy or unstable to be comfortable. One form of artificial tooth provides a stable and realistic replacement for a real tooth and as such is increasingly becoming the choice of substitute for patients. A dental implant is a solid metal screw that is secured directly into the jawbone, to which an artificial crown is attached. Because the implant is anchored to the jaw itself it provides a level of stability second only to a real tooth. With the advances in ceramic technology, the attached crown can also be incredibly lifelike and does not prohibit the eating of certain foods like bridges or dentures. Dental implants can usually be fitted in two or three sessions with the dentist. The screw will be implanted during the first session and then allowed to fuse with the bone and gum in a process called osseointergration. This usually takes two to three weeks before the remaining parts of the implant can be secured. Dental implants are as close to real teeth as are available. Because the root of the implant is secured to the jawbone like a real tooth, it acts and feels like a real tooth. If you have a missing tooth or are looking to replace an earlier dental substitute, make an appointment to see a dentist.For more information on dental implants in Shimla please call Goma Dental at 177-645-0704. Cosmetic dentistry is a combination of conventional dentistry practices with an added emphasis on art and aesthetic qualities. Its primary aim is to make the teeth look more pleasant and appealing rather than specifically repairing any damage. It has become increasingly more popular in recent years thanks to the development of various dental techniques and the wider availability and affordability of treatments.Dentists are now able to create a perfect smile for any patient, regardless of the quality of their existing teeth There really is no problem too big or small that cannot benefit from some form of cosmetic repair. For teeth that are chipped or broken, patients have the option of cosmetic bonding which can be matched to the colour of existing teeth before being applied and hardened in the desired shape. Alternatively, ceramic porcelain crowns or veneers can be attached to broken teeth to restore the cosmetic appearance and act as a barrier to further damage. Using the very latest CEREC technology, ceramic restorations can be designed and manufactured in the same day, eliminating the need for lengthy laboratory manufacture. Patients with badly discoloured teeth can have the natural colour restored either with a row of dental veneers or by using a teeth whitening system such as Zoom. Using a bleaching agent, usually hydrogen peroxide, teeth whitening systems cover up discolouration caused by age and food stuffs that have accumulated over time. Teeth whitening procedures can whiten teeth by up to ten shades and have the most dramatic cosmetic effect. Other cosmetic treatments include teeth straightening using orthodontic braces, dental bridges and implants to replace one or more missing teeth or even dentures to restore whole missing dental arcs. Whatever the problem, cosmetic dentistry has the solution to create beautiful teeth that can help restore confidence and self-esteem.Having a beautiful and healthy smile can make patients look much younger and is one of the most simple ways of making yourself more attractive. Make an appointment to discuss cosmetic dentistry with your dentist and see what wonders can be performed for your smile. Of all the most feared dental procedures none is so iconic or dreaded as the root canal. The obvious reason behind this is the presence of the dentist’s drill.However, the reality is slightly different. A root canal treatment is actually one of the most useful dental procedures that can make the difference between keeping a tooth and losing it. A successful treatment can alleviate pain and significantly reduce the need for further expensive treatment.When a tooth becomes infected it is attacked by the bacteria and begins to die. This can be very painful as the infection occurs in the sensitive centre of the tooth, where all the nerve endings are located. A root canal will remove all the infected pulp, before filling the cavity with medicine and sealing it so no further infection can occur. This way, you may loose the sensitivity of the tooth, but the pain and infection will be gone, and you still have your original tooth. Today, you will find that root canal treatment makes use of all the latest technologies. Regardless of your issues with dental medicine, you will find that each office has a number of resources to help you. This includes state of the art pain management protocols, as well as ultra quiet drills.Without a question, if you can arrange to visit a dentist in Shimla, it will be worth your while to ask about root canal treatment. Himachal dental offers ProTaper rotary root canal preparation.There is accumulating evidence suggesting that rotary NiTi instruments facilitate root canal preparation with minimal or no canal transportation or in simple terms a perfect Root canal prepration for a healthy smile. In just three visits to your dentist, you can have peace of mind knowing that you will be doing everything possible to preserve your natural teeth. Caring for your tooth after a root canal treatment will require nothing special. Your dentist will probably suggest a good oral hygiene program, healthy lifestyle and proper diet in order to ensure perfect oral health. Sinu Lift is proving to be the safest way to lift the sinus membrane. A minimally invasive, non traumatic approach for sinus lift with Predictable results. The Sinu-Lift System, from Innovative Implant Technology (IIT), is a new surgical technique which is designed for the maxillary sinus lift. A minimally invasive procedure which allows for the placements of the implants in the maxillary sinus region. * The Sinu-Drill. This is an intelligent self regulating mechanical hand device that drills the path to the Sinus membrane, disengaging upon contact to avoid rupture. * The 3mm yellow curette, which is used initially to gently separate the sinus membrane from the bone. * The 4.2mm blue curette, with a flexible tip and can be used if additional elevation is required. * A bone packer is provided to helpfill the cavity with bone graft. * 3.2mm calibrated drill to prepare perforation (ordered separately). The smart Sinu-Drill perforates through the bone without rupturing the sinus membrane. Versatile set of flexible curettes help in obtaining the ideal membrane elevation for desired implant.The unique bone packer will easily and accurately allow the placement of bone grafting material. For more information visit innovative implant technology. SimPlant Crystal, is the latest software version of Materialise Dental’s highly-acclaimed SimPlant software. SimPlant offers you a fully integrated dental implant treatment planning tool that visualizes your patient’s anatomy with unparalleled precision – in 3D. As a SimPlant user, you will have no problem with finding the ideal position of the implants, while taking into account both clinical and esthetical considerations. When it comes to diagnostics and treatment planning, you need images of unrivaled clarity to work with. In comes SimPlant Crystal – providing you with crystal clear images from CT and cone beam scanners. SimPlant Crystal is easy to work with, it’s even compatible with all CT scanners, cone beam scanners and implant brands on the market. 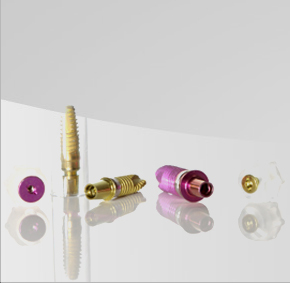 And multiple SurgiGuide drill guide solutions provide a more time and cost-efficient way to realize esthetic perfection. The beauty of SimPlant is that you have a fundamentally simple tool which will guide you step by step during your implant planning. As such, you can comprehensively plan a case with ease and confidence. This tool can further be used to communicate with your patients in a way that they understand what you plan to do and how you plan to do it.From scan to plan to guide, to the ultimate Immediate Smile, SimPlant Crystal gives clinicians the opportunity to plan their surgery time more efficiently, accept more referrals and enjoy a higher revenue on even the most complex cases. It also allows them to continue working with the implant brands and scanning equipment they already know and use.